Our book club alternates meetings between restaurants and our homes. As the “one with food issues,” I am given the final say on the restaurants where we’ll meet and eat. No problem there. It’s when we gather at one another’s homes that problems arise. What can Amy eat? I bought these gluten-free crackers especially for her. Oh, I forgot she can’t have milk. When did Amy become allergic to soy, I thought she just had celiac disease? Why isn’t she eating the carrots? What do you mean the veggies can’t be served on the same platter as the crackers? Just this morning one of my book club friends asked if I could eat Chicken Curry (our current book takes place in India). I figured she had found a safe recipe for me; after all, isn’t curry often made with coconut milk? When she emailed the recipe, I was surprised to see sour cream and mayo. Now this is a person I have traveled with and eaten out with many times, so I was a little surprised she didn’t remember I was allergic to dairy and eggs. Of course, there are several perfectly acceptable things I could have done. I could have suggested she take a look at the recipes over at Freedible or on my Pinterest board and make some substitutions. I could have asked her to make me a plain piece of chicken. I could have offered to make a salad or a side dish. But I simply told her I would eat before I came. You see not eating at book club IS NOT A BIG DEAL. I am there for the book discussion and the comradery. And okay, maybe a little for the wine. But never for the food. I have learned a long time ago that eating before I go to people’s houses is safer and easier–for me and for the host. Of course, when first diagnosed, I do remember feeling left out, especially during the holiday season when the food looked so festive and tasty. I do remember wishing I didn’t have to always pass on the birthday cake or the special tapa a chef brought to the table. But somewhere along the way, I stopped caring–and when I stopped caring, I started enjoying life more. While I consider myself a true foodie, I don’t feel like food always has to be the center of every social event. I can enjoy myself on just about any occasion without having to eat. In fact, by not having to think about what’s in that curry sauce, or if there are croutons in the salad, or if that fork touched the pasta, I am free to enjoy myself more. I think it’s harder for those without dietary restrictions to understand this. So tonight at book club, I’ll probably be asked why I’m not eating along with a dozen other questions about what I can and cannot eat. But that’s okay. I figure if I keep declaring my independence from food and my food restrictions, someday my friends will stop trying to feed me. 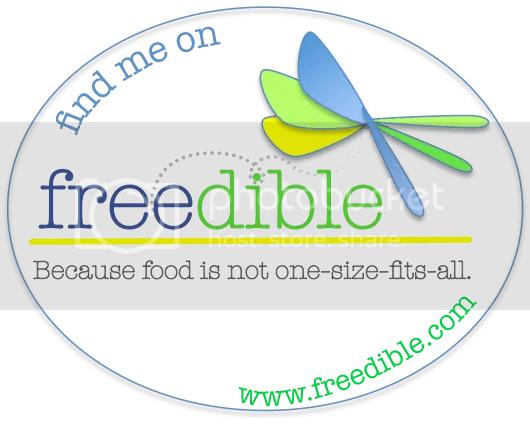 This post originally appeared on Freedible in honor of Declare Your Independence from Food Restrictions Month. Anyone with any food restrictions should check out this website. It’s a place to connect with people who eat the way you do. I am somewhere in the middle of this process. No longer do I have the constant fear of missing out (fomo) that comes with newly recognised food allergies. It is balanced by my cognition of the drastically negative effects that “just having a bite – what harm will it do?” thinking has on my wellbeing. But I am not yet comfortable enough with myself and my “allergic foodie” skills to bravely go into social situations like this brave lady does. Onwards on the journey! We have a new goal! In my early days of food allergies I was so afraid of offending people that I would take a bite of something I knew would make me sick the next morning (note: I don’t experience anaphylaxis or I would never have done this!). Once a good friend was so proud that she marinaded the steak in gluten-free soy sauce entirely missing that I’m allergic to soy as well as have celiac disease! My husband was so mad at me for eating the steak, but I just didn’t want to hurt our host’s feelings. Oh I paid for that! I think in a way it helps to have celiac disease when you also have food allergies. With celiac disease you know you can’t eat just one little crumb of wheat because you will damage your insides and longterm effects are significant. With anaphylaxis you also wouldn’t eat a tiny bit of something. But when it’s gastrointestinal symptoms or brain fog reaction, you might “test the waters” more. Like every once in a while I’ll test to see if I’ll react to soy lecithin because I read research that says I shouldn’t react to it. But I always do. I HAVE BEEN A VEGETARIAN FOR YEARS– DON’T EAT SUGAR– OR GLUTEN– OR FOODS WITH CHEMICALS– OR PREPACKAGED FOODS– OF FOODS WITH GMO’S IF POSSIBLE— OR– OR– OR– OR– OR– WE DON’T EAT AT ANYONE’S HOME EITHER– & WE DON’T EAT OUT MUCH EITHER!!!! IT JUST SHOCKS ME THAT SO MANY PEOPLE JUST EAT CRAP-TERRIBLE FOOD—- & WONDER WHY THEY HAVE HEALTH PROBLEMS!!!!!!!!!!!! An Allergic Foodie bows her head and shyly says, “I used to be one of those people who ate crap-terrible food.” Not all the time, mind you, but enough to probably do some damage on my body. I was a busy, busy mom and embraced the fast-food culture. I wish I’d taken the time back then to make food to take to those hockey and lacrosse games and skipped the Taco Bell runs! That’s a great attitude to have. I often get stressed worrying if I will be able to feed my son when we go out. But if I take his food with us it solves that problem and you don’t need to rely on whether you will be catered for. Yes! And if you pack your son’s food, you don’t need to worry if he’s going to get sick or you’ll have to make a trip to the ER. I’d rather focus on the social situation than have to focus on what I’m putting in my mouth. Many times I BMOF (bring my own food) or eat first. Super positive attitude. I too often eat before I go somewhere. I have low blood sugar so skipping eating is not an option. I have a few food allergies but raw carrots tops the list. If someone touches the carrot and then grabs some chips and I take some chips — it is not a happy event. The one thing that worked out well at social events or work meetings where there was food — I got to go through the line first so there was no cross contamination. If everyone of us with food allergies could adopt Amy’s attitude as outlined below, life would be a whole lot easier! This was a really interesting post. Thank you! I work in Japan at the moment, and am allergic to fish/shellfish and tree nuts. I’ve lived here a while now and for a long time I would order carefully, explain to restaurant staff and those I was with, but then eat, hoping and trusting that it would be fine. However, with more experience and knowledge of how varied food allergy awareness is, along with the fact that sharing food from the same dish is common, I’ve started to eat before going to events, or eat when I get home. Although this is the best strategy for me, it always seems to make everyone uncomfortable and I find myself constantly explaining about it every time I go out…(I feel like a broken record that comes across as paranoid!). It doesn’t help that I’ve always been thin and some people have gone so far to wonder aloud if I eat enough… Because they’re colleagues it all just feels so awkward every time so now I try and avoid the work functions that are less ‘important’. I really aspire to just not caring, so thank you for sharing your experience! You are most welcome, Emma, and thank you for sharing your experiences. I find it interesting that people feel it’s okay to comment on your weight, wondering if you eat enough. People wouldn’t comment on you not eating enough if you were overweight. 🙂 At least I hope they wouldn’t. Lately, I’ve been quickly changing the subject when people want to know why I’m not eating . . . sometimes it works, sometimes it doesn’t.